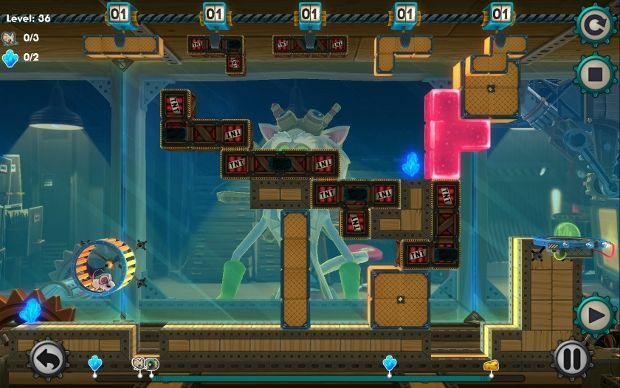 At first glance, MouseCraft reminds players of two classic puzzle games: Tetris and Lemmings. The pieces are there on a superficial level. Three mice walk blindly forward under a specific set of rules; meanwhile, the player rotates and places tetrominoes to aid in reaching the goals. That is where the similarities end. The mice themselves never take on any special roles, and the tetrominoes do not disappear when fit together in a line. Indeed, a lot of the puzzles require that the blocks do not fit snugly together, which runs counter to conventional play with them. 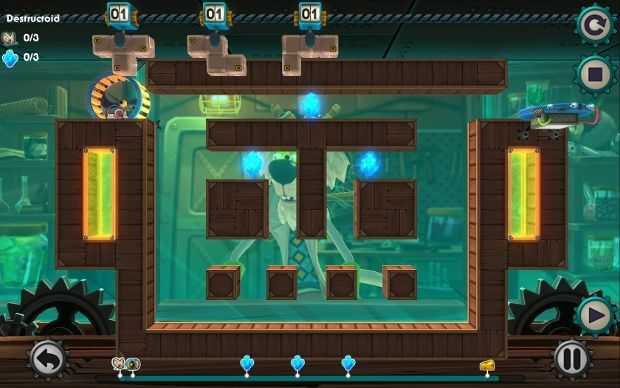 MouseCraft is very much its own puzzle game with its own puzzle premise, and that premise is pretty good. MouseCraft starts out with a simple instruction: get the three mice from their wheel to the cheese safely. Once a mouse is sent on its way, it will walk slowly to the right until it hits a wall two or more blocks high, until it reaches the cheese, or until it dies. Mice can climb exactly one block height, and can safely fall three squares worth without smashing into the ground and leaving a Pikmin-esque ghost behind. So it begins with a series of insurmountable pits to cross and perfectly fitting tetrominoes to plug the gaps. Of course, the mechanics do not remain this simple throughout. 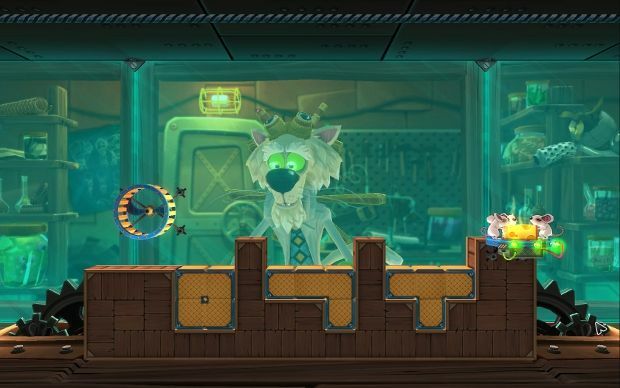 Eventually, optional objectives are added through crystals to collect, turning it into a matter of hitting various points of interest in a level before finally making it to the cheese. Most of the time, finding the solution is not just a matter of discovering the correct position and orientation of the placed blocks, but also finding the right timing. Sometimes, it is beneficial to have a path of blocks laid out from the start, other times it is necessary to set the mice in motion before placing blocks behind them. To this end, there are handy time freeze and undo buttons that see a lot of use. After a new element is added to the mix, there is a level or two teaching how it acts and interacts with other objects, then a handful of levels playing around with the idea. What results is a sort of ebb and flow of difficulty, where the game is ever increasing in complexity, but each step up is softened by a generous tutorial level. Eventually, players have access to bombs that destroy entire tetrominoes, blocks made of jelly that break long falls, evil rat robots to avoid, and more. Just when it starts to feel like MouseCraft is running thin on ideas, a new piece is introduced and it opens up new puzzle opportunities. Despite the complexity, MouseCraft never reaches hair-pulling difficulty. There are a few headscratchers that take some deep thought and experimentation to get through with a gold rating, but in general, the levels are small enough and the number of tetrominoes to place is low enough that the possible combinations of actions is never overwhelming and the solution presents itself within a few minutes of tinkering. Diehard puzzle fans might be a bit turned off by the medium difficulty, but the more straightforward puzzles were more satisfying to complete than the busier, more cluttered puzzles. When the player is given too many pieces to work with and unclear mini goals to string together, it becomes a little more frustrating. Thankfully, most of the 80 puzzles included are bite-sized affairs, and through clever design, they do a good job of making the player feel smart. For creative types or those wanting more after the included puzzles are exhausted, there is a level editor included (used to make the rad -- and solvable -- puzzle below). Sadly, there does not appear to be support for sharing creations with others yet. Aesthetically, MouseCraft is cute and functional. It runs with a semi-cartoony look that fits the light theme of an anthropomorphic cat running potentially deadly experiments on mice. The soundtrack is fine, but not outstanding. Like elevator music, it provides a background and stays out of the way, but it never gets memorable or exciting. 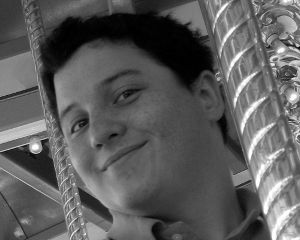 The story is probably the weakest part of MouseCraft, though it certainly is not the focus. After a short cutscene to vaguely set up why the cat Schrödinger is running these experiments, he exists only in the background until the end. Cutscenes are injected throughout to remind the player that he needs to buy more cheese every now and then, and it all culminates to a weird punchline cutscene that does not really work comedically or make sense otherwise. Still, most will come to MouseCraft for the puzzles, stay for the puzzles, and ignore the narrative (or lack thereof). To that end, it does an admirable job, constantly introducing new ideas so that each chunk of levels feels fresh. Over the four hours it takes to see the end, and additional time to complete entirely, it never overstays its welcome. The concept behind it is solid, and it has been developed well past that initial idea.